So you have decided to install that metal roofing. Good for you! If you are in semi-good physical condition and you have enough construction know-how to read a tape measure, remember the three, four, five, square rule (explained later for the complete novice) and have hands that are able to grip a screw gun, the battle is half over. Let’s also say your home has the normal run of the mill roof with a roof pitch that is somewhere between 3 inches of fall in 12 inches (3/12) and 6 inches of fall in 12 inches (6/12). These roofs are fairly easy to walk on and aren’t so steep that you can expect to slide off them. If you are a first timer, easy is probably an understatement. 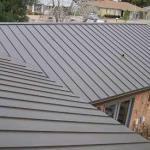 Is installing a metal roof something the average, semi-handy homeowner can accomplish. Without a doubt and it’s not that difficult. Let’s talk about the physical condition part. You are not running a marathon here, it isn’t a race. You don’t need to be in tip-top physical condition. None of us are. You will be working for yourself and at your own pace so you can work as fast or slow as needed depending on the individual. You will of course be making several trips up and down a ladder and you will be walking and kneeling on an uneven surface. Get a good pair of kneepads and expect that you might be using a few body parts that aren’t used to it—not that you’re straining them, you’re just using them and they haven’t been used since…you can fill in that blank. You’re going to save some serious money so the occasional ache is worth it—those are temporary anyway. Plus you’ll have the satisfaction of knowing you did it yourself. Okay, now let’s make sure you have enough of the basic tools to get the job done. A good pair of leather or heavy canvas gloves is a necessity; the edges of those metal panels are pretty sharp sometimes. As I mentioned earlier you’ll need a tape measure, depending on the size of the roof maybe two of them. A 25 footer and a 100 footer will be all that is needed for most roofs. You will need the basic hammer, utility knife, wonder bar or pry bar and some sort of straight edge. You will also need a couple of chalk lines, remember, red chalk is permanent; it works well on the underlayment or sheathing. Use blue chalk if you chalk a line on the finished panels, blue is temporary and can be swept or washed away. Metal or tin snips are next on the list. You could get by with the yellow handled or straight cut snips but it is nice to have the green (right cut) and the red (left cut) snips also. Now for the power tools. Most important is the drill or driver that you will use to install the fasteners. While any standard or cordless drill will work we have found that a DeWalt DW-257 driver works the best. DeWalt doesn’t pay us to say that either. We have found the DW-257 will outperform all of the other brands and last longer than brands that can cost up to $100 more than it does. If you have a small project your cordless or standard drill will work just fine. If you have a larger project buy the DeWalt DW-257, your hand and wrist will thank you. If your roof has hips and valleys you are also going to need some type of power tool to cut all of those angles in your roof panels. 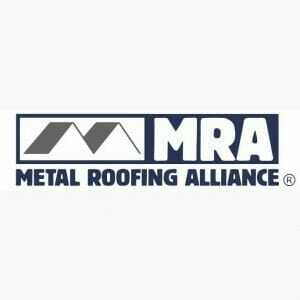 While a profile shear is the recommended tool of choice, unless you are a metal roofing contractor you probably don’t own one. They are expensive and something you will never use again. Most of us have a circular saw, don’t we? If you purchase a 7 1/4” carbide tooth, metal cutting blade for your saw you can make all of the angle cuts that you need to. One blade will more than last long enough for most roofs, and it only cost about $45. A side grinder and a cut-off wheel can also be useful when making smaller cuts, like for example starting the hole for a vent pipe that falls on the panel’s high rib. We recommend you keep the abrasive wheel cutting to a minimum. The sparks from the abrasive wheel are really little pieces of metal. 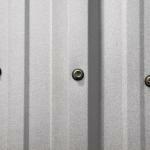 This metal can get imbedded in the paint surface of the roofing panel and cause rust or corrosion over time. The abrasive wheel also burns the paint in the area of the cut and again causes rust or corrosion. In case, carbide metal cutting or abrasive metal cutting, we strongly recommend you make most of your cuts on the ground if possible. If it is impractical to make your cuts on the ground, set up a temporary work area on your roof. This can be accomplished with a couple sheets of OSB or plywood and a couple of saw horses. When you are finished cutting take care to blow off the roof and remove as many metal chips as you can, a common leaf blower works well for this. Remember when you are cutting or grinding with any type of blade, wear protective eye gear. A long sleeved shirt and gloves are also recommended. 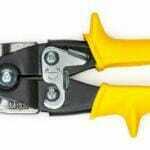 Air nibblers and electric shears are available at most home supply stores. 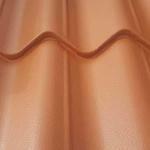 They can come in very handy when you are installing you metal roof. One of our favorite shears is the Malco Turbo Shear it is designed to be used with a standard or cordless drill. You can find it at Northern Tool; my last one cost about $90. The Turbo Shear is a very handy tool for making the long rip cuts yet its handy enough you can use it to cut circles also. A good, quality step ladder and a good extension ladder are also going to be needed. Depending on the roof you may want to look into scaffolding or maybe some kind of man lift. Most of all you are going to need a good helper, maybe a son or daughter, maybe a friend or neighbor, maybe even your spouse. If all else fails look for a good handyman or laborer, you are still going to save money installing the roof yourself. Now you had to read thru all of this and you still might be wondering about that three, four, five square rule or method as some call it. This is a simple little trick that construction guys use to make them look really smart. It goes like this: Measure 4’ up from your fascia on the gable of your house and make a mark as close to the edge of the gable fascia as you can (as with any project that is new to you it may be best to start in the back). Now start at the same corner and measure 3’ down the eave and make another mark right on the edge (if you were to draw a line between the three points you should have a triangle). Measure the distance between the marks on the diagonal and it should be 5’. If it isn’t, your eave fascia is not perpendicular to the gable fascia and you are going to have to adjust accordingly to make the corner square. You want the vertical metal panels to be perpendicular to the eave and the ridge on the standard gable roof homes. Measure the distance between the eave and the ridge and make sure they are equal. If they are equal, make your adjustment at the gable. Most metal roofs have trim at the gable that can hide a little adjustment. Well, you have some plans to make and maybe some tools to buy. Good luck with your project and let’s be careful up there. If you are not comfortable walking on the roof of your home seek professional help.